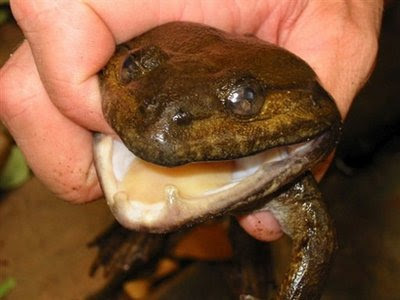 I just want to take a moment to introduce the Khorat big-mouthed frog to the Ugly Overload community. This frog is among 163 new species discovered in the Greater Mekong region of Thailand. How does it feel, you fang-mouthed frog, to know that you have a ready-made blog family awaiting you with open arms the very moment that you're discovered by us humans? That's got to give you a nice warm and fuzzy feeling. Photo source: AP Photo/David S. McLeod, WWF Greater Mekong via Yahoo! SICK! SICK! SICK! SICK! SICK! SICK! SICK! SICK! SICK! SICK! SICK! SICK! SICK! SICK! SICK! SICK! SICK! SICK! SICK! SICK! SICK! SICK! SICK! SICK! SICK! SICK! SICK! SICK! SICK! SICK! SICK! SICK! SICK! SICK! SICK! SICK! SICK! SICK! SICK! SICK! SICK! SICK! SICK! SICK! SICK! SICK! SICK! SICK! SICK! SICK! SICK! SICK! SICK! SICK! SICK! SICK! SICK! SICK! SICK! SICK! SICK! SICK! SICK! SICK! SICK! SICK! SICK! SICK! SICK! SICK! SICK! SICK! SICK! SICK! SICK! SICK! SICK! SICK! SICK! SICK! SICK! SICK! SICK! SICK! SICK! SICK! SICK! SICK! SICK! SICK! I love it! His teeth are crooked and he is still smiling! Goodbye to the Chinese Paddlefish? What's In A Name? Publicity.